Not every high end Dining experience is going to be on the Strip. Every once in a while, you're going to come across a fine dining option in unlikely places. Take for instance Chart House, tucked away inside the Golden Nuggets' Rush Tower on Fremont street. Not known for its class and elegance, to find a spot like this on Fremont is quite the treat, and what the Chart House has to offer only makes it that much more irresistible. When it comes to fine dining, atmosphere is key. When you step inside the Charter House, it's hard not to get a sense of extravagance" Set right at the center of this establishment is a 75,000-gallon aquarium, filled with an assortment of gorgeous tropical fish. This peaceful centerpiece keeps a calm and soothing aura, which amplifies the Dining experience quite a bit. The lunch menu offers lighter options such as caesar salad, heirloom caprese, coconut shrimp, and a seafood salad trio. Chart House's' dinner menu, on the other hand, is a healthy mix of light and heavy cuisine. Enjoy an extended appetizer menu that adds duck pot stickers, fried asparagus, bruschetta sliders, and crab, shrimp, and vegetable fritters. In the way of entrees, Chart House delivers a selection of classic and unique dishes. Fish and chips compliment a menu of seafood that includes sword fish, Chilean sea bass, salmon, flounder, and mahi. For flavors from the land, the main selection opens up to include a succulent New York strip, filet Mignon, lamb chops, and prime rib. All dishes can be served with shoestring fries, mushrooms, mashed potatoes, green beans, and fried mac and cheese. No meal is complete without a sweet ending, and Chart House has two signature dishes to deliver. A hot, chocolate lava cake caters the chocolate lover in us all with a chocolate cake fled with a rich, melted center infused with Godiva liquor. The soufflé is a lighter portion, served with either a chocolate, raspberry, or creme englaise. To go along with your dinner or lunch, Chart House offers a massive collection of wines, and champagnes. The menu is well over 50 wines large and pulls from various regions like California, Australia, Argentina, Italy, and Germany. 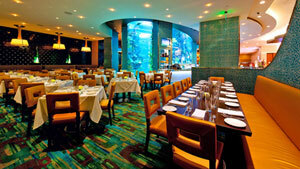 If its fine dining you're looking for, Chart House has what you need. Don't let the location on Fremont sway you. 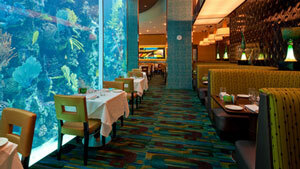 This is a restaurant that has earned its rightful place amidst Vegas' top fine Dining establishments.